Thousands of Filipinos filled the Big Dome recently to witness the annual ABS-CBN Christmas special, featuring the performances of the country’s brightest stars. Dubbed as “Da Best Ang Pasko Ng Pilipino: The 2011 ABS-CBN Christmas Special,” the event not only showcased enthralling performances, but also reminisced on the real message of “Da Best” Christmas, which is love among all Filipinos. Catch this celebration on ABS-CBN this Saturday and Sunday, 9:30p.m. “Flashy and breathtaking,” these are the words that best describe the production numbers that can be watched this weekend. The opening number will shine brightly as most sought-after Kapamilya singing stars such as Piolo Pascual, KC Concepcion, Anne Curtis, Jericho Rosales, Sarah Geronimo and many more perform a Christmas medley. Star Magic artists like Kim Chiu, Xian Lim, Enchong Dee, Jodi Sta. Maria, Julia Montes, Kathryn Bernardo and many others will also jazz up the evening with their glitzy production numbers. Love teams will also perform romantic songs that will give everyone a reason to fall in love over again. The Kapamilya network also takes pride in introducing their new shows for 2012. One of it is “Walang Hanggang,” which will feature the much-awaited comeback of Richard Gomez and Dawn Zulueta. Together with co-cast members, the two will sing a romantic song. This will also prompt the beginning of Coco Martin and Julia Montes’ new love team. To inspire every Filipino family to welcome “Da Best” Christmas, ABS-CBN Chairman and Chief Executive Officer Eugenio Lopez III and ABS-CBN President and Chief Operating Officer Charo Santos-Concio will give their Christmas messages. 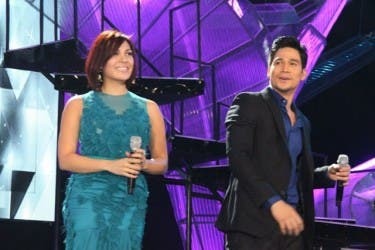 Don’t miss “Da Best Ang Pasko Ng Pilipino: The 2011 ABS-CBN Christmas Special” this Saturday and Sunday, 9:30p.m. on ABS-CBN.